Second, let's have another project, yes? I will confess to not having the stamping prowess of most of you out there, and certainly nothing I stamp could even come close to what the amazing W&W Talent does every day. That doesn't mean that I don't love and covet stamp sets, though. And if you're a simple stamper like me, the good news is that there's a place for everyone in the crafting community. That said, I really wanted to challenge myself at least once this month. I've seen people do such amazing things with stamping and watercoloring--especially when it comes to florals--so I told myself I would give it a shot. It sort of worked. I suppose I didn't end up actually doing any watercoloring, but I still got the results I was hoping for and what I did was way more involved than I usually get when I stamp. Also, I just flew by the seat of my pants. I bought watercolor paper (because I intended to use them), and rummaged through my box of tools that I put away years ago looking for one of those blue water brushes. I know my mom gave me one about 9 or 10 years ago, but of course I couldn't find it. I did, however, find a box of unused blender pens, again years old, but I thought I'd give them a go just to see what happened. The result? Darn near exactly what I pictured when I imagined myself watercoloring! 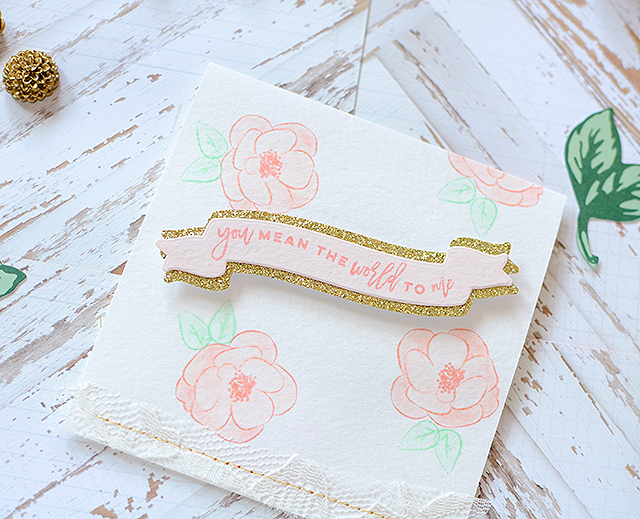 I stamped a floral image in Papertrey Ink's Melon Berry, then dabbed my blender in the ink and started coloring. I got the shade variation I had hoped for and when I added some minty leaves, it looked even better. I'm officially hooked! I did a whole 9" x 12" page of the florals and leaves (which, by the way, are from The Big, the Bold, and Extras set) and then tried to decide what to do with them. In the end, gift wrap won out (as is usually the case for me). The paper size was large enough to wrap a small box (mine is just under 4" x 4" square). It's thicker than most wrapping paper so a bone folder to press down folds and creases, as well as super sticky tape are handy tools. It's definitely a labor of love, but some people are just worth the extra time and effort, don't you think? When it came time to add finishing touches, I tried to keep them simple, not wishing to cover up the pretty florals I had spent the last hour painting, er, blending. A thin strip of lace tied on with some coral pink twine was my trim. 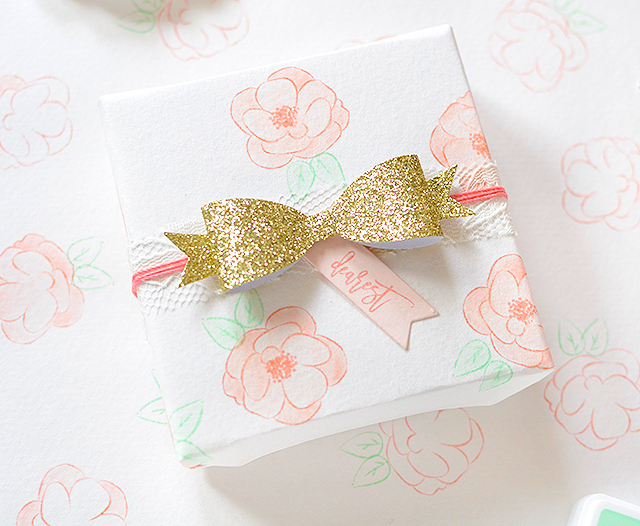 Then a gold glitter bow that I made with the Take A Bow cutaways (*possible new favorite die set!!! ), and a little tag with 'dearest' stamped on it. I didn't really mean to return this week with another gift box and card set, but I had a 4" x 12" length of stamped paper left so I couldn't resist turning it into a card. I cut 4" off and folded the remnant into a 4" x 4" card. 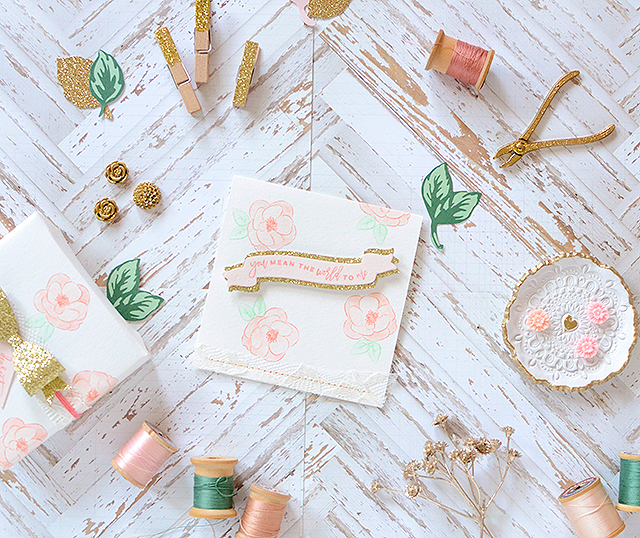 Again, I didn't want to add a lot of elements to it, nor did I wish to cover up the flowers, so I stitched a piece of lace along the bottom edge and cut 3 banners out of gold glitter (2) and pink (1) paper, then matted them together, the pink sitting center on top of the 2 golds. 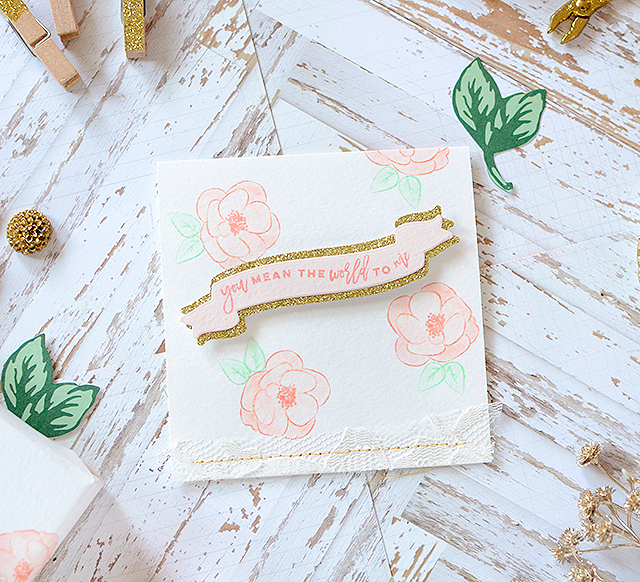 The banner die comes from The Big, the Bold, and Extras cutaway set, which matches the stamps I used for the florals. I needed a sentiment and was hoping for something that would coordinate with the package. The Sentimental: Love stamp set offered the perfect words; I just had to add a little bit of a curve to them when I stuck them to my acrylic block. It looks like it was meant to be, doesn't it? I'm not sure what took me so long to try adding a little color variation to my stamps, but I am hooked now! I encourage you to try something 'new to you' this week, too. I HIGHLY recommend Winnie & Walter stamps and cutaways (dies). They're such good quality and I swear that every new item I use instantly becomes my most favorite thing ever ;) I'm really excited about my next W&W post so definitely check back here in a week's time. (There just might be a giveaway happening and you don't want to miss it!) Have a lovely weekend! so soft and pretty with that touch of gold! lovely! 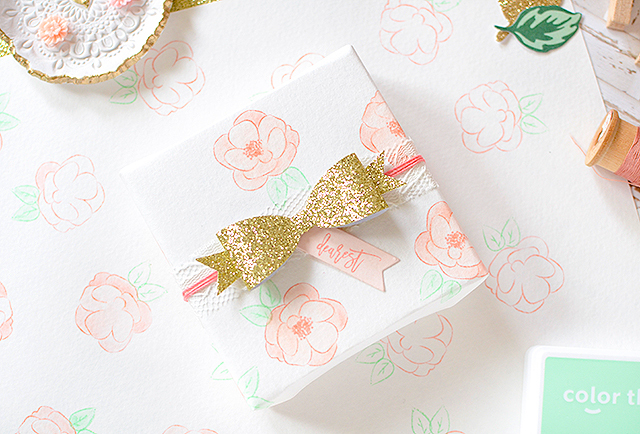 I really love these super-pretty and feminine pastels with the gold. I'm not sure what these blender pens are that you used, but your watercolor effect is just beautiful. 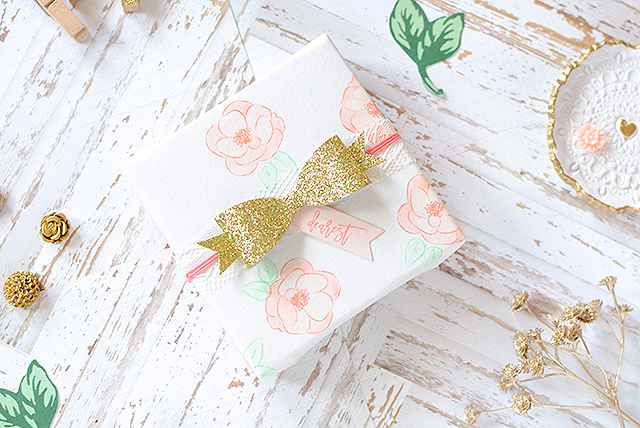 Love that you did another gift wrap example along with a coordinating card from the leftovers. These are such unique ways of using the awesome W&W products!! Thank you so much for sharing with us!! I love the soft colors and textures! 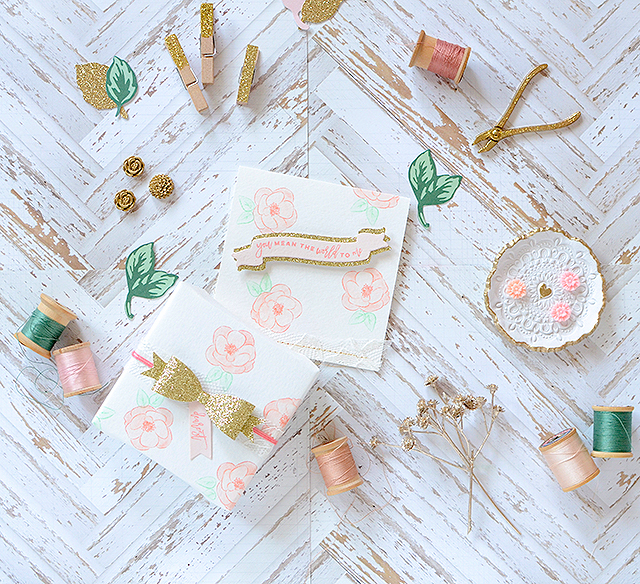 Beautiful gift box and card set! These are sooooo gorgeous and I love your photography. Stunning work!! 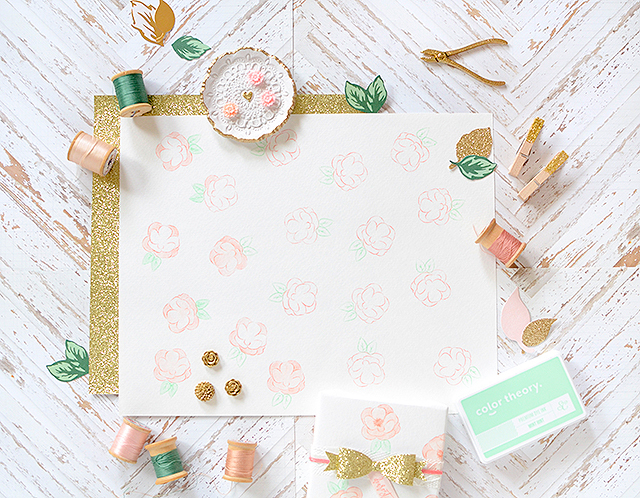 Love the soft pastel colors and the addition of gold as well :) The photos are very pretty too. Very pretty colors and I like the gold sparkle. You're a great Leading Lady! I've now got to try actually using my blender pen--what a happy accident that you couldn't find your water pen! More gorgeousness! I love the the mix of textures, the sparkle, the softness, just so delicate and well balanced! 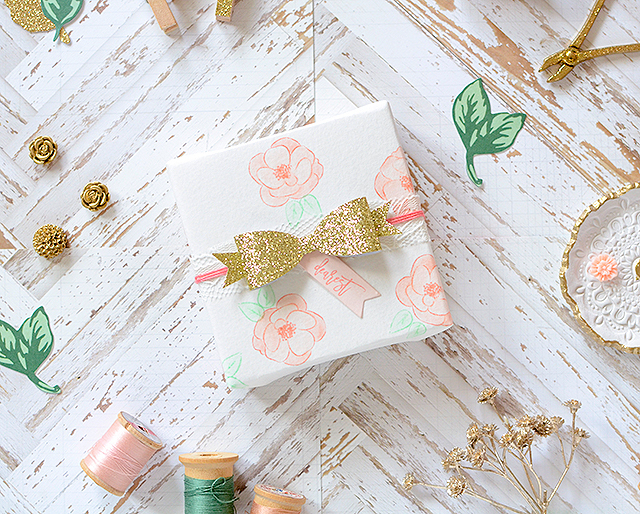 Another dazzling card-and-wrapping presentation, Rebecca! Beautiful water-colouring (a medium I so struggle with...sad, but true!) with results that are nothing shy of gorgeous. Your 'labour of love' will be much appreciated and treasured by the lucky person receiving this marvelous ensemble. You are an incredibly inspiring Leading Lady! Wow! Love your pretty creations!!! gorgeous! I love the color combo on all of these! 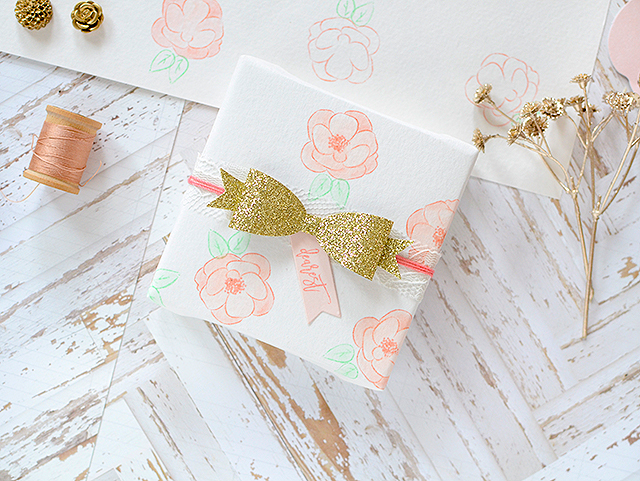 The pink and gold, and your beautiful details make these projects real standouts! Seriously beautiful, Rebecca, a job well done! How pretty...love the soft colours and the touch of lace on the edge. How did I miss this soft delicate beauty?! I remember your debut, was smitten by your finale, and somehow life was busy and missed the two in between. So glad I took time to back track! You've inspired me to look at my stamps and dies in so many new and different ways. Wish you could stay forever with W&W! Love that peach and green. Good enough to eat!